As you know I've been looking through lots of old SF magazines at the internet archive, both at MPorcius HQ in the Old Line State and while staying here with in-laws in the Carolinas. 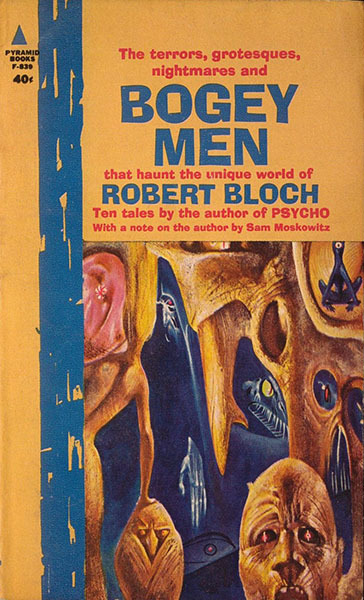 One name I keep seeing on covers is Robert Bloch's. 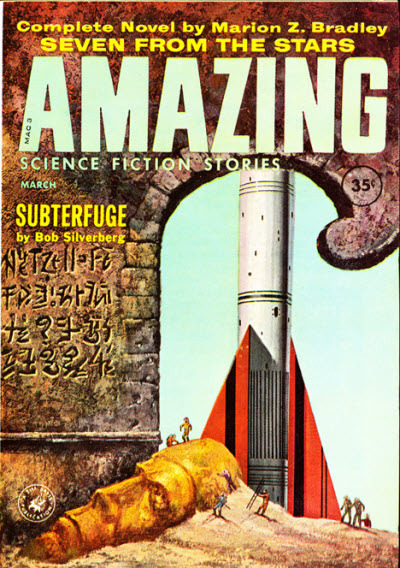 So let's read six stories penned by the creator of Norman Bates that were printed in SF magazines in 1960, the year of the Kennedy-Nixon presidential race, the first practical laser, and the first airing of The Flintstones. We'll do three stories today and three more in our next blog post. 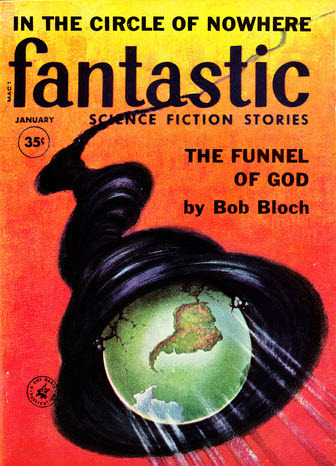 The editorial in the issue of Fantastic in which "The Funnel of God" appears, signed by editorial director Norman Lobsenz, is all about "Bob" Bloch, as he is styled on the cover. Lobsenz jocularly calls attention to Bloch's practice of denouncing cultural trends in his stories, but by the end of the editorial he is sincerely praising Bloch for having the intellectual ability to use SF as a "tool of social criticism" and the "guts" and "energy" to do so. The editorial suggests that there is a debate raging in the SF community on whether SF should be used to address social issues, and that Fantastic's line is that it should, in part because the newspapers "report the most atrocious and outrageous events every day--and hardly anyone gets mad anymore." Bloch, according to the editorial, is a much needed outlier! The plot: Harvey Wolfe spends his youth on his father's estate in South Africa. His mother dead, his father absent for years at a time, Harvey is raised by the Boer couple who manage the estate. On a nearby mountain lives an old Zulu witch doctor, a master of bats and vultures. He may be an emaciated relic who lives on scraps brought to him by vultures but, thanks to his ability to cast forth his soul to any part of the world, he knows all! This weird wizard, known as the Black Skelm, recognizes in the child Harvey a fellow "seeker." Harvey visits the Black Skelm only once, and then he is sent to America, to New York, to stay with relatives and live among English-speaking people and get a decent education. Civilization turns out to be just as corrupt and disgusting as the Black Skelm warned him! When his father dies and a 21-year-old Harvey inherits three million bucks, he drops out of university and wanders the world for years, searching for "truth" via psychology, philosophy, the hard sciences, drug use, sexual license, etc. Harvey's Candide-like quest affords Bloch the opportunity to spend page after page attacking our society. Finally, after all routes to enlightenment have disappointed, Harvey gets a dream message from the Black Skelm and he returns to Africa to meet the cave-dwelling savant. The Black Skelm shares with Harvey a magical seed, and the two leave their bodies behind, become huge spirits, so huge that to them the Earth is a speck! The wizard contemplates destroying the Earth, declaring that civilization is nothing more than a cesspool and war-like humanity will soon no doubt destroy itself. Harvey objects, suggesting that maybe they can save mankind, reform the human race, but the Black Skelm tells him he only feels that way because he is a white Westerner and has not suffered as has a black Third Worlder! (I told you this story was "woke"--the wise and oppressed black dude practically says to the rich white man "Check your privilege!") The Black Skelm blows a funnel of black smoke from his mouth that destroys the Earth and he becomes as a God--Harvey screams and is engulfed in the funnel, perhaps to be destroyed, perhaps to be tortured eternally. This is one nihilistic story! Bloch suggests that the human race is so crummy that its destruction is not a tragedy but a consummation devoutly to be wished! Did Bloch's dog die the week before he sat down to write this thing? Harvey's first meeting with the Black Skelm is an effective bit of fantasy writing that exploits white fear of and fascination the non-white "other" and the supposed special powers of non-whites, and in the early part of the story Bloch works hard to build up a South African atmosphere, throwing lots of Afrikaans lingo at you and describing the region's animals and landscapes and peoples. (I have never been to Africa and have no idea if Wisconsin-born Californian Bloch's portrait of South Africa is authentic, but he does manage to construct an image in the reader's mind.) This part of the story is good. 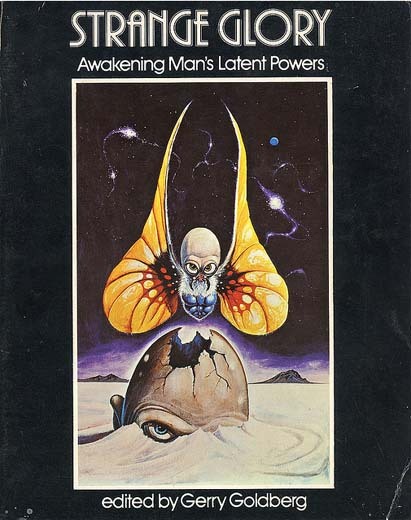 But the long middle section attacking white civilization's many failings gets a little tedious--it lacks the vivid reality of the African scenes and especially that first scene with the wizard, who is a striking and well-drawn character. The middle and ending of "The Funnel of God" feel like a shaggy dog story--Harvey, with us readers in tow, follows a bunch of dead ends that do not advance the plot and in the end we learn he has failed to accomplish anything. I will say that, taken as a whole, this story is acceptable, perhaps marginally good; the good parts and the parts that may not be good but are strange and surprising outweigh the bad. I've told you what the good parts are, and the bad parts; the interesting if not good parts include the surreal over-the-top sense-of-wonder ending, and some specific elements of Bloch's cultural criticism in the middle section. Bloch writes a lot about a specific Disney cartoon, criticizing its content and its influence on the animation field and on viewers. 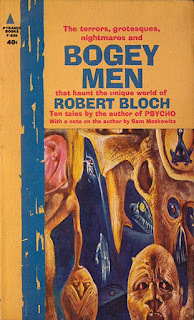 Bloch also talks a bit about monster movies. I didn't expect to get a revisionist history of the cinema of the fantastic in this story! Bloch's attack on the film industry feels serious and informed, and is the best part of the anti-Western middle part of the story; in contrast, his swipes at the business world and academia and the military and the religious establishment feel like tired boilerplate. A strange artifact with many noteworthy components. "The Funnel of God" has reappeared numerous times, including in The Best of Robert Bloch and the anthology Strange Glory. "Beep No More, My Lady"
This one appeared first in Fantastic Universe and, according to isfdb, was not reprinted until 2005 in The Fear Planet and Other Unusual Destinations. 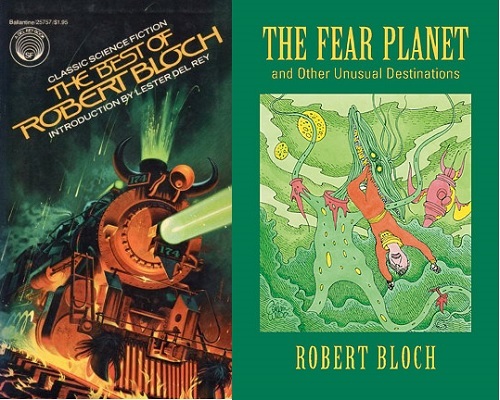 I actually remember seeing a copy of The Fear Planet in the Mid-Manhattan branch of the NYPL when it was a new release--the Gahan Wilson cover looked different from anything else on the shelf.. In the end the TV people use this crisis to augment their reach to the point that it is ubiquitous. 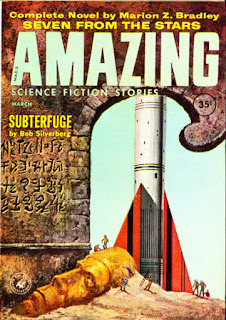 "The Man Who Murdered Tomorrow"
"The Man Who Murdered Tomorrow" appears in an issue of Amazing with a great cover--I'm a sucker for astronauts discovering ancient ruins. This is a very talky story in which Bloch presents theories about famous murderers like Jack the Ripper and Lizzie Borden (e. g.; J the R is a symbol and a cause of the end of the Victorian era of "hypocrisy," "sham gentility" and "maudlin morality.") A five-star general sits in a room alone, day after day, with the button that will launch America's atomic weapons; he is to push it if he gets a signal from his superiors. A writer who has written about J the R is our narrator; he comes to visit the general (a childhood acquaintance) and finds that the general, forbidden booze and tobacco, has only a stack of books to while away the hours--this stack of books is made up entirely of nonfiction books on murderers. He puts forward to the narrator his theory that a time period is best represented or symbolized by its most famous murderers. After talking to the general the narrator talks to a medical man responsible for the whole "put a guy in a room with the nuclear launch button" project. We learn that, as in Kris Neville's 1949 story "Cold War," the responsibility of controlling the nuclear weapons that keep the peace is too much for people and drives them insane--the general is not the first to have this job, his predecessors having gone bonkers. Then the twist ending. The narrator contrives to get access to the button and gives a little speech about how ours is an age of mass media and mass communication that causes mass frustration and is symbolized by mass murder. Mass frustration is reflected in violent entertainment, such as that produced by the narrator, but writing out his fantasies of murder is no longer enough--the narrator covets the ability to create literal mass murder, and control of the button scratches that itch! The authorities try to get him away from the button, and in the struggle he pushes it. Again with the prediction that mankind is going to destroy the world, again the complaints about violence in the media, again the generalization and universalization of human shortcomings. So many SF Cold War paranoia stories and misanthropic stories lump all of humanity together, as if the Western democracies are as equally tyrannical and as culpable for the Cold War as the Soviet Union and as if all of us are somehow like Jack the Ripper or Lizzie Borden. I reject this attitude. The theory about sensational murderers symbolizing their eras is thought-provoking even if, on reflection, it is ultimately sterile--couldn't you argue that every famous person or incident symbolizes its era? And isn't every era's "essential nature" up for grabs? Sure, there are people who think of the Victorian Era as hypocritical and phony, but couldn't you marshal just as much evidence that the Victorian Era is a period of improvements in standards of living and increasing democracy and individual freedom, or a period of stability and peace after the long period of revolution and war from 1789 to 1815 and before the long period of revolution and war from 1914 to 1945? Anyway, because of this theory, which has some novelty, I'll say "The Man Who Murdered Tomorrow" is acceptable. "The Man Who Murdered Tomorrow" would reappear a few times, including in the collection Bogey Men. Three misanthropic stories with downer endings that I can only endorse in a lukewarm way. "The Funnel of God" has a quite good supernatural horror beginning, and an audacious bizarro cataclysmic ending, and both "The Funnel of God" and "The Man Who Murdered Tomorrow" put forward unusual idiosyncratic theories, and so are worth a look, but today saw no love connections. 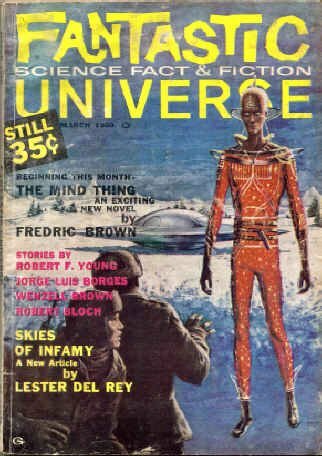 Well, maybe I can be more enthusiastic next time we meet and we talk about three more Bloch stories from 1960 SF magazines. Jack the Ripper is to Bloch as JFK is Malzberg. Ahhh, this is an interesting analogy!